Be on the lookout for lots of souls to be released from purgatory on Monday due to the sheer volume of offering up I'm going to have to do. -2- Also as part of my preparation, I have been hoarding yarn so that I can knit while I am off. I am always inspired by seasonal color schemes, and I saw a ripple blanket pattern recently paired with yarn in shades of blue, gray and white that are beautiful and wintry. I MUST HAVE THAT YARN. Looking at color schemes makes me feel so inspired and excited to create new things. I have been pairing a new yarn order with yarn that already exists in my stash as leftovers from previous projects (see how economical I am?!) and am planning ripple blankets that could bring warmth to my entire town. I just have to find out what all of their favorite color schemes are and I'm all set. -3- I have also been working on the cardigan that is one of Mike's Christmas gifts and this is another thing for the "offering up" pile. I have fallen out of love with the pattern, but I'm FAR too into it to start anew. I simply have to keep going or Mike will never get a hand knit cardigan, no doubt about THAT. And so on I go, knitting resentment into every stitch that I endure that curling pile of stockinette fabric on my lap. Maybe I'll get a lot done on it next week while I'm off. :-\ I still have a front panel, two sleeves, and enough seaming to make me want to gouge my eyes out to go. -4- I have also been downloading books to my Kindle with zero guilt because I cannot be laid up without anything to read. In fact, I can think of nothing worse than to be stranded somewhere without any reading material. I'd better hope a fully stocked book cart washes up with any future shipwreck I'm a part of. But anyway, I'm currently reading Walking with Mary for the next installment of the Catholic Book Club. I also started a fun romance called Love Finds You in Glacier Bay, Alaska. I have almost 20 Amish fiction titles on my Kindle waiting to be read, as well as other inspirational romances, romantic suspense titles, and Catholic books. I feel quite proud of myself for this achievement. -5- And one of my new downloads is Totus Tuus: A Consecration to Jesus Through Mary with Blessed John Paul II. I used the book 33 Days to Morning Glory last year, and LOVED it. This year, I'm going to mix things up and use Totus Tuus. I started the prayers yesterday, for a consecration day on the feast of Our Lady of Lourdes, February 11th. Excited! This books features an intensive schedule, with prayer, Scripture reading, reflections from John Paul II, resolutions for the day, and encouragement to journal throughout the 33 days. I am loving it. -6- In other perking news, Anne has been *adorable*. She plays so well by herself! Is this a "girl thing" or a "second kid" thing? At any rate, she is so cute about it you can hardly stand it. Mike gets out the vacuum cleaner, and Anne is right there beside him with her little pink one, vacuuming along with him. She knocks around in her little toy kitchen and brings us over wooden frosted cookies that she "baked." :0 She talks to her Dora dollhouse figures and tells them all about her new sippy cup and her tea set. It's absolutely precious and heartwarming. All right, I'm off to mope some more. I will be on Twitter, and I will post again on Tuesday. Have a great weekend everyone! 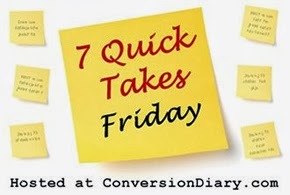 Catch more 7 Quick Takes over at Conversion Diary! Are you a knitter? How fun! I've just started to crochet and am really enjoying it. Hope your dental work goes smoothly! Will keep you in my prayers that all goes well and you'll get to do something with all that hoarded yarn!